Even on the opening day of the F59 Fast Cycle Route there was protest. The village council of Geffen stopped the party, literally, at a zebra crossing with a school crossing patrol. 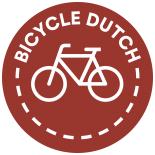 After a small delay the festive cycle tour could continue and the opening festivities of the fast cycle route from ʼs-Hertogenbosch to Oss went ahead as planned. One of the new marks in ʼs-Hertogenbosch. Originally the marks didn’t have the blue background, now they all have. 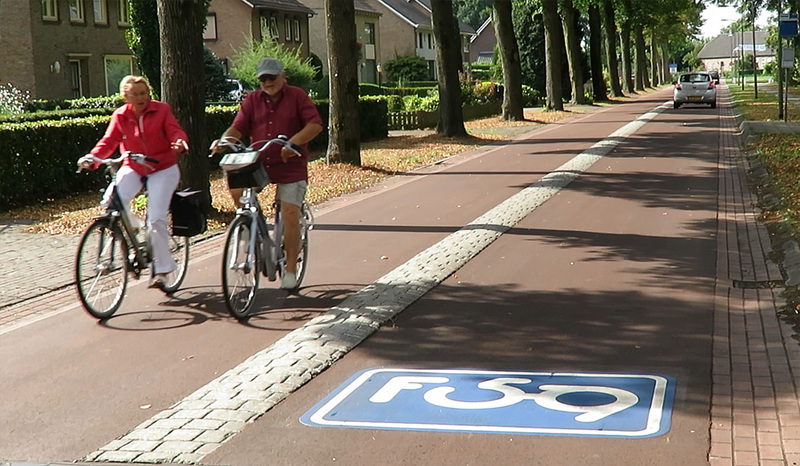 The aldermen of Oss and ʼs-Hertogenbosch and a representative of the province of Brabant cycled from town hall in Oss to the municipal border with ʼs-Hertogenbosch, where they placed the last of the F59 markings. They were accompanied by about 20 people and the men of the Dutch Bicycle Band (Fietsorkest) who took care of the music as they did in Utrecht recently. To get to that place, the party had to go through Geffen, where the village council had opposed to the route from being built in their village centre, because they felt fast cycling would not be appropriate in a village centre. The village council only wanted to discuss a detour around the village and they “distanced” themselves from the F59 cycle route when that was not considered a viable option. As a result, the fast cycle route is now interrupted for about 900 metres. “The ‘F’ in the F59 fast cycle route stands – according to many – for ‘Flop'” The headline of the local paper on the opening day is very negative. The local newspaper is also very negative. They published an article in which they say the route is so bad, that for many the F in F59 stands for “Flop”. The paper came to this conclusion after it called on its readers to report their views on the new cycle route. “We received dozens of reactions, they were almost unanimously very negative. According to our readers the crossings have bad sight lines and it is unclear who has the right of way. People don’t see the need of the route and especially the confusion about the course of the route, due to the missing part in Geffen, is criticised.” On the internet the response was even worse. Many of the reactions make clear, however, that the authors cannot even have seen what they are writing about. What they state as facts is simply untrue. What may play a role, is that many things changed, even on the last day before the opening. Some people comment on a situation that hadn’t been finished yet. Most of the markings on the street were only placed one day before the opening. I had filmed and described the route one month before the opening and I couldn’t be at the opening festivities, but all this commotion was more than enough reason to cycle the route yet again, one day after the opening, to make a report and to see how “bad” the final route really is. 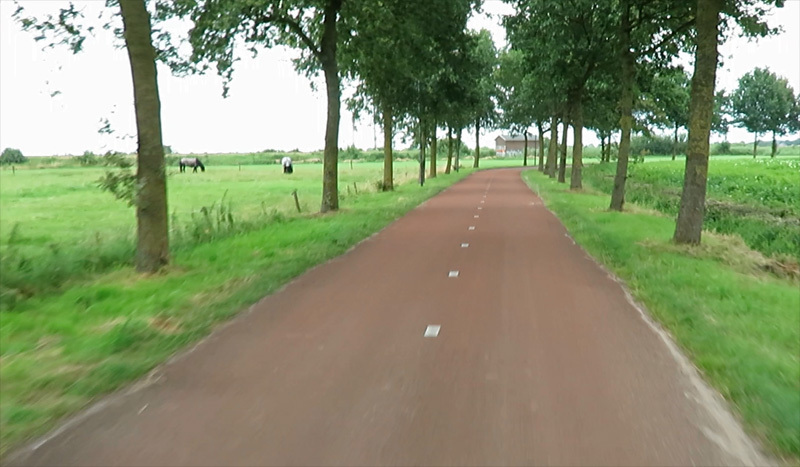 In my video of just one month ago there were no lines on the edge of this cycleway (with limited access for motor vehicles of residents). Just before the opening of the F59 cycle route this part got clear lines on the outer edge. Much better for the visibility of the edge in the dark. After seeing the entire route again, and considering how the press generally reports on these “fast cycle routes”, I get the feeling people simply misunderstand the concept of these fast cycle routes. The Dutch name of “Fietssnelweg” turns out to be a very bad choice. It has the Dutch equivalent of “freeway” in it. That means people want to see overpasses and underpasses: anything but level crossings. Even though you have to give way only 4 times in the 20 kilometers of this route, people therefore write “nowhere in the route you have priority”, which is simply untrue. There are many crossings where you do have priority when you cycle. The new cycle streets, where cars are guest, are also heavily criticised. 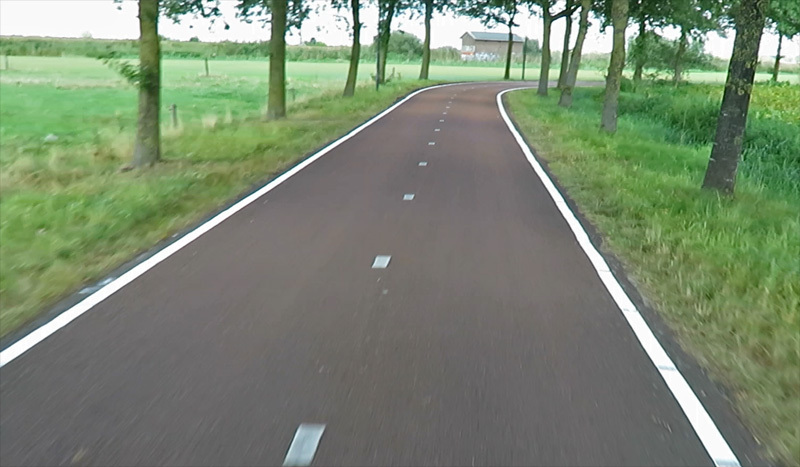 The concept of cycle streets has become better known in the cities, but it is still very new in the country side. The same concerns people voiced years ago in the cities are now repeated in the villages. That it is logical to give people cycling more space when they outnumber cars is apparently hard to explain and hard to sell to people. But why would you cling to a strip next to an empty carriage way, that has also become too narrow due to the recently increased volumes of cycling? Having observed the new cycle streets in action again, to film them, makes me even more convinced that they work. The drivers I saw all went completely to the other lane when overtaking. Most people cycled in the street and really in the middle of their lane (very unusual for Dutch cyclists who are conditioned to stay to the side as much as possible). Only a few people still cycled on the former cycleways next to the Waterleidingstraat, where they were kept as non-mandatory cycleways. Cycle street in the built-up area in Geffen. People also complain about the central mountable divider. They fear it will become slippery in the rain. We should also not forget that the negative response is a collection of reactions on the internet and to a newspaper. A few dozen in an area where tens of thousands of people live. I would like to see a real user experience investigation. I think that would look rather different. Simply because the facts and suppositions, on which many of the current negative reactions are based, are wrong. 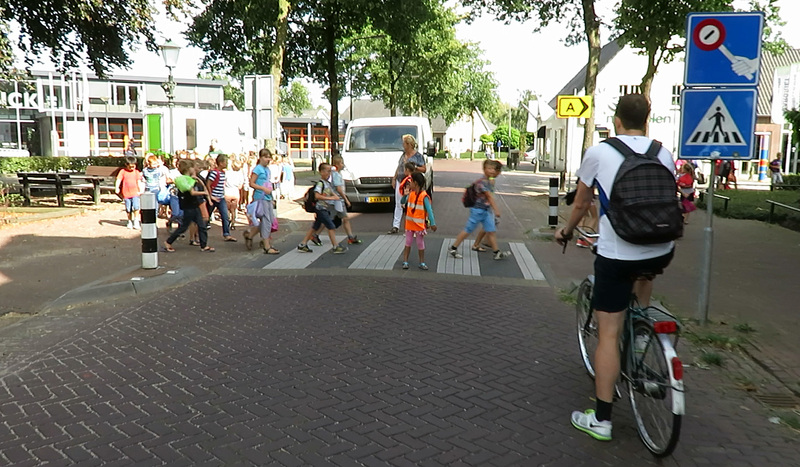 This zebra crossing is manned by a school crossing patrol four times a day (when the children go to and from school in the morning and in the afternoon). That is why the village council of Geffen believes there cannot be a fast cycle route passing here, because that would be dangerous. The most unclear part of the route in Geffen, where the F59 takes an unexpected 90 degree turn, will be taken care of this very week. 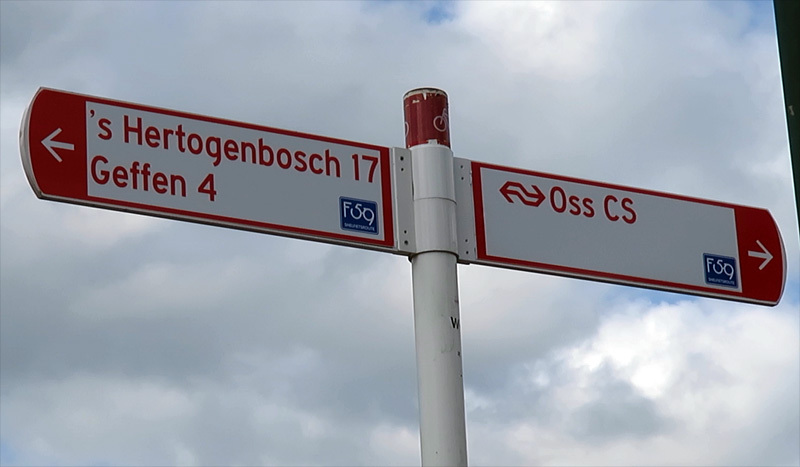 When I visited the route last Friday the municipality of Oss had put up signs that from the 19th of September the intersection would be closed for works for one week. Looking on the internet to find what was going to be done revealed this: “The intersection will be reconstructed to make a more logical and more recognisable transition to the fast cycle route F59”. The signs with directions for cycling now have an added F59 mark. One of the reasons for the village council to oppose the red asphalt of the cycle route so vehemently, is that they want to retain the village character with the cobble stones on the village square. A report on their website about the future of the village tells a different story. Residents complain that the village square lacks life. “After town hall was closed” (because the village now belongs to the municipality of Oss) “the village square has become little more than a parking lot”. The villagers themselves would like to change their village centre to make that more like a ‘place’. I wonder how much more time it will take, before the village council finally understands that when you design for the bicycle you improve the living environment for people. 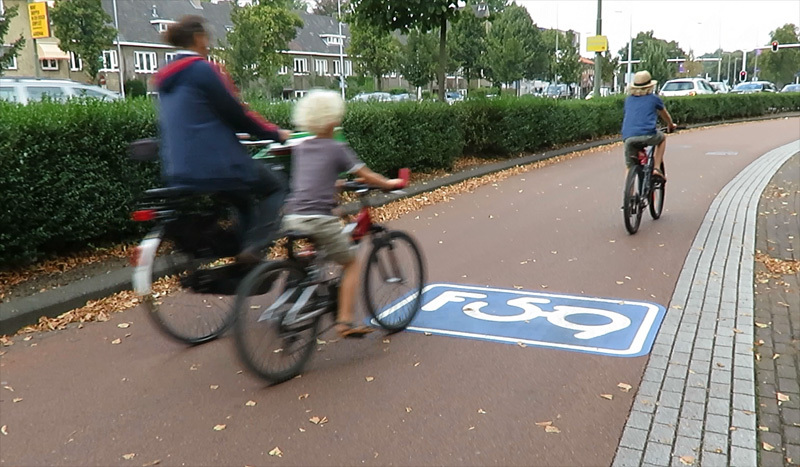 Allowing the F59 cycle route to become more visible in their village centre would bring the desired life to it. Even in the Netherlands that still isn’t clear to everyone. Follower Jintensha Oni on Twitter analysed several of my longer rides, also for the F59 when I last rode it. If you just look at what the F59 is today, you see a very fine connection for people who want to cycle safe and fast from one point on the route to another. Time will tell how many people that will be, but I have the feeling it will be many more than some expect. What does the sign that shows a hand holding a sign (on the photo of a zebra) mean? Is that a warning of a regular manned crossing patrol at the zebra crossing? Pingback: Streetfilms | What Streetfilms May Emerge from VeloCity 2017! Great article, Mark. Thanks for putting the complaints in perspective and going into detail describing some of the crossings, all very helpful to better understanding the situation. I think you are not all that fair to the people that complain about this route. Half of the complaits where from cyclists, that would like a ‘fietssnelweg’ but feel that this isn’t it. A lot of the complainst where aimed at the cycle street, as you mentioned: and I frankly agree with them. As was mentioned by multiple people: it would have been a better option to expand the cylcle path next to the street. Seperating different modes of mobility is a basic concept to promote cycling in a safe way: cycling streets are a good alternative where you lack the space to do so, but that isn’t the case here. As for the junctions: sure, people used hyperbole to describe the situation. But they aren’t wrong: how many ‘snelwegen’ for cars have you seen, where you don’t have priority? The name promises something, that it doesn’t deliver. And why are cyclists wrong to demand the same thing. Every time you have to stop, is time lost. I think it’s a mistake to downplay peoples concerns this way: this is not a ‘we don’t want cyclists here’ mentality. It’s more of a need and desire to see things done well. Because if you don’t keep public support: then no one is going to finance the next project. I don’t agree with your first point: Keeping the old cyclepaths while having a cycle street is a perfect solution for those who are to timid to ride on street, while evereyone who doesn’t panic sharing the road sometimes can use the pleasant and wide cyclestreet. On your second point: you’re totally right. Maybe these peoplein Geffen should check out what was achieved at the Mariaplaats in Utrecht? Thinking of that band, have you ever seen the Dutch army soldiers on WW1 era uniforms and bicycles playing rather large instruments as a band? Link here: https://www.youtube.com/watch?v=xo8DlBkSW_w Some people in the comments say that it’s almost too Dutch; they approve entirely. 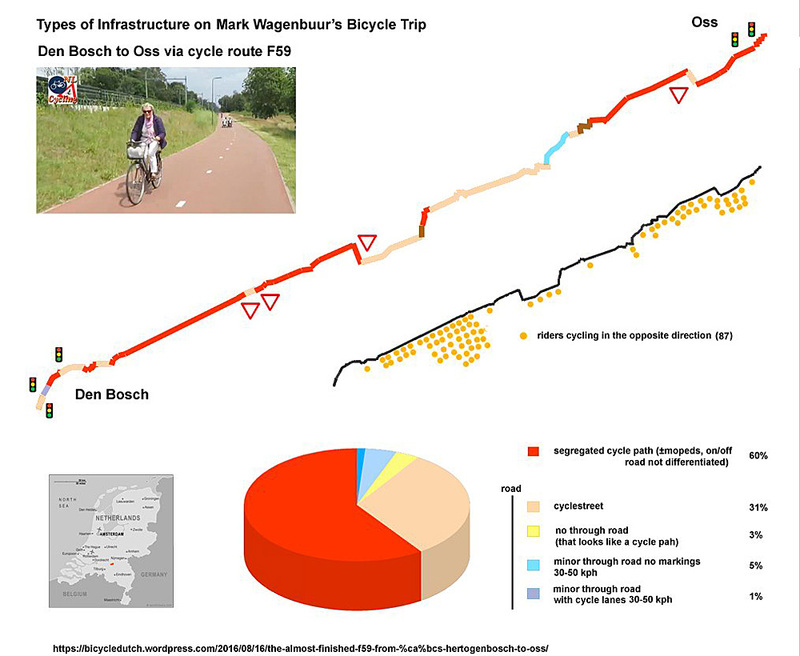 This entry was posted on 20 September 2016 by Bicycle Dutch in Original posts and tagged ’s-Hertogenbosch (Den Bosch), cycle superhighways, long distance cycle paths, NL is not perfect, Oss.